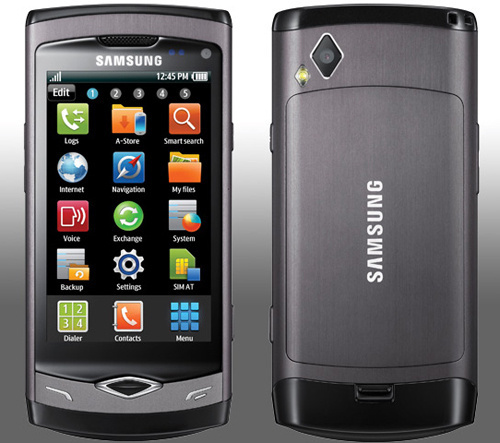 The Samsung Wave had its official coming out party MWC 2010 and is now hitting the market. The new Samsung Wave, which is running Samsung’s new OS titled ‘Bada’, is now available in Europe. The Samsung Wave features the first Super AMOLED screen to hit the market, has a 1Ghz Snapdragon processor, features Touch Wiz 3, Samsung apps, a 5 MP Camera that can record 720P video, and features both BlueTooth 3.0 and WifI 802.11n. It touts this phone as being the first to market with both Bluetooth 3.0 and 802.11n. Cool yes, but is Bada good enough to compete with Android, iPhone, or even Nokia out in Europe? I think it is going to be a tough sell. Bada is a brand new OS with limited app store when compared to Android and iPhone. Bada features Samsung Apps which is their new ecosystem that is already featured on Symbian and Samsung branded Windows Mobile phones, but the apps are still in small numbers when compared to market leaders. Samsung still needs to work on getting developers interested in Bada. Samsung is not putting all its eggs in one basket by any means, we are expecting to see a Samsung branded Windows Phone 7, Android, and possibly more Symbian devices later in 2010. Samsung is dipping its toes in the ‘Bada’ (lol yes it means Ocean). We will sit back and watch how it all plays out. I am 22 years old, I am a little bit new to writing but I love it and I am addicted to gadgets, whether it be Phones, PC's, OS's. Software. I love it all!